I’ve been grilling for the last 25 years and for the first five of those years, I was using your regular, average, everyday Supermarket sauce. They’re pretty good and by no means do they produce bad tasting meat, but I was ready to move to the next level; I was ready to find the best barbecue sauce. So, I started searching for lesser known, better quality sauces that might propel my meats into greatness. Let’s just say that what I found made me certain that I’d never go back to Walmart again looking for sauce. I’ve changed sauce many times over the years depending on what kind of taste I want, but these five sauces I’ll be discussing with you today are sauces I’ve used and thought where exceptional. They make this sauce out of Apple Cider Vinegar, Tomato, Brown Sugar and some spices they keep secret. I’d love to know what those spices are because I’ve never been able to recreate the flavor, which is the reason I buy the sauce so regularly. Unsurprisingly Sluggo’s Gluten Free regularly wins and places highly in competitions throughout the United States including the Royko BBQ Festival. What makes it stand out is the sweet taste they get from the High Fructose Corn Syrup. so it’s perfect for Poultry, Meats, and Fish. It’s completely homemade so it’s not assembly line manufactured and this gives it an original feel you don’t get from supermarket sauces. If anyone is reading this and thinks they’ve had Sluggo’s before but can’t recall the name, that’s because Sluggo’s used to be called Big Boss Sauce. Well, I’m happy to inform you that the recipe hasn’t changed and Sluggo’s Gluten Free is just as good. There comes a time in every grill enthusiasts life when weight becomes an issue. Believe me, I’ve been there and certain changes had to be made. Sluggo’s tastes so sweet, but that sweetness comes from the High Fructose Corn Syrup which is not exactly healthy so sometimes you need to find some other wonderful sauce that’s a little bit healthier to use as an alternative because there’s no way you should have to give up grilling right? Bill’s is made of all organic ingredients from organic onions to organic peppers, so it’s completely chemical free, and it’s also Soy free Gluten Free and has no Corn Syrup inside. It tastes mild and leaves a hint of sweetness in the mouth coming from the small amount of Organic Sugar in the recipe. Definitely, one of the healthiest sauces on the market and this is where its popularity comes from, but you won’t feel like your taking the healthy option when you taste it. This sauce comes from Kosmos Q, is completely made in America and they actually started making it in a barn next to the family home before success made them into a huge company. They never lost their roots though and I like this sauce because it tastes like something I’d make except a little better. So we’re talking about a rustic home feel with a slight tangy twist at the end, and this taste is the reason the Competition BBQ Sauce won the World Championship in 2015. 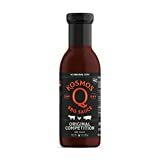 In fact, anyone who is familiar with the American BBQ competition circuit will have heard of Competition BBQ Sauce because Kosmos Q has been pitting it up against the best since they started making it. If you simply can’t choose between these sauces, then perhaps Jack’s is the right choice because it comes in four flavors. You get Hickory Brown Sugar, Honey Smokehouse, Spicy Original, and No.7 Recipe. Honey Smokehouse tastes a lot like Sluggo’s with its sweet flavor, so it’s intended for Pork and Shredded meat sandwiches. Spicy Original and No.7 recipe is for those who love hot sauces but they’re not overpowering in the way some of the options on the market tend to be. Hickory Brown is a cross between the two so while it has a slight tang that lingers in the mouth, it is predominantly sweet. Jacks Combo is a great range of sauces, from a trusted name and it’s certainly a cut above the rest. If you’re the type of person who like me often comes home from work and shoves a Jalapeno Pepper in his mouth with Bacon wrapped around it then these might be a good choice. These are all hot so while you get three flavors: Hot, Original and Hickory; they’re all rich with spices and will blow your mind. They each have a red color coming from the use of Tomato’s and Cumin seasoning, but the Tomato flavor isn’t overwhelming and instead you get rustic taste with a hint of onion. The hot flavor reminds me of some of those super-hot sauces people make from home with fresh peppers and so it’s one for hardened spice fans. But they’ve taken the spices down a notch or two with the original flavor to produce something a lot like Jack’s Spicy Original. Hickory is more of a rich almost A1 type of sauce for Sausages and ribs and it actually goes well with breakfast foods like Egg’s and Bacon. A next level BBQ enthusiast will have all of these sauces at home, but if you can only choose one then it would depend on what your particular taste is. 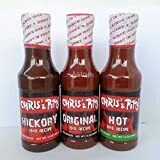 For spices, you should go for Jacks or Chris’ and Pitt’s, and you also get more than one flavor with these so if you have trouble choosing then these would be a good option too. The sweetest flavor is from Sluggo’s and I think along with Competition Sauce, it’s the most enjoyable on this list, but for something similar but better for your health Bills Best Organic is a great choice. Whichever sauces or sauces you go for I think you’ll be pleased with the taste you get. Best Barbecue Party Games – The American Way!